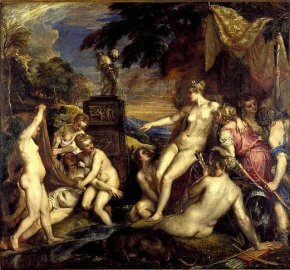 1/3/12 - Acquisition - London, National Gallery and Edinburgh, National Galleries of Scotland - There was much scraping together to come up with the needed funds for the purchase of the second Titian belonging to the Duke of Sutherland, Diana and Callisto. The owner had already ceded its pair in 2009, Diana and Actaeon for the modest sum of 50 million pounds (a "friendly price") to the National Galleries of Scotland and the National Gallery in London (see news items of 28/8/08, of 27/1/09, and of 4/2/09). The two museums pulled together in order to prevent these masterpieces painted for Philip II of Spain from separating so that they could remain in the United Kingdom where they have been exhibited to the public for several decades already, as the duke had make a long-term loan of some of the most important works in his collection to the Edinburgh museum. However, the duke was asking for an additional 50 million for Callisto, whose loves might seem expensive indeed. Given the problems faced by the two establishments in raising such a sum once again, the duke cooperated by lowering the price to...45 million pounds, to be found before March 2012. In order to meet this goal, the Trusties of the National Gallery of London finally reached a weighty decision : allocating 25 million for the purchase by drawing this important amount from reserves made up of public bequests accumulated for years by the museum for future acquisitions. The balance, also a considerable sum, was paid with the help of various patrons . Furthermore, the duke has also promised to leave the works in his collection which are currently exhibited to the National Galleries of Scotland and the English public. This matching pair will thus avoid separation and be presented together alternately in both museums, with the exhibition period determined according to the financial contribution made by each one. The painting Diana and Callisto is currently visible in London for eighteen months (and will soon be joined by Diana and Acteon after a regional tour in July), then will reside in Edinburgh for twelve months. Both paintings will then be shown in London for three years and in Scotland for two. Finally, a longer exhibition cycle is planned : six years in London and four in Scotland. Although we are thrilled that Titian is to remain in a public collection, we are also concerned about the conservation conditions of these two masterpieces which will be moved to and fro on a regular basis.